← Coloring pages for Adults… Some Drawings of Living Rooms for Adults to Color. Today, after 5 years of writing articles about gardening and interior decorating, my blog reached the point of having over 2 million page views/articles read. 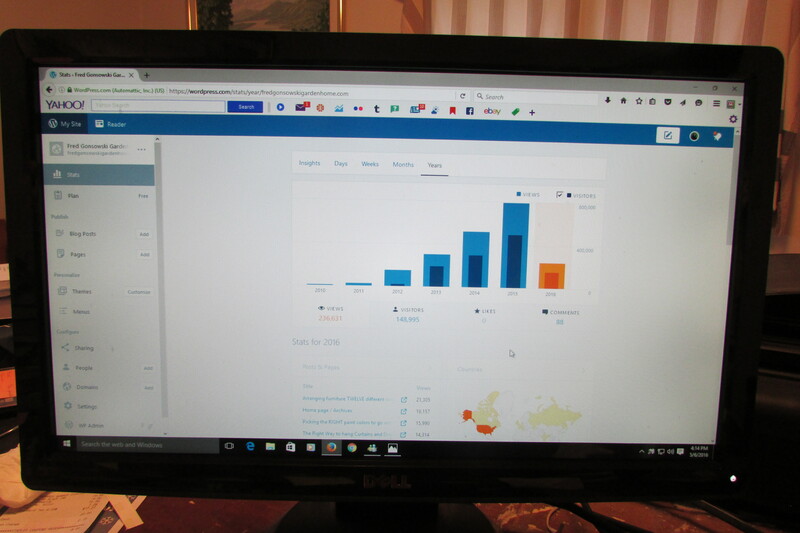 Looking at the above photos you will see that 1,133,893 visitors, over the past five years, looked at one or more of the 173 posts that I wrote, which when all added up by WordPress (I counted nothing) got me over the 2 million point. 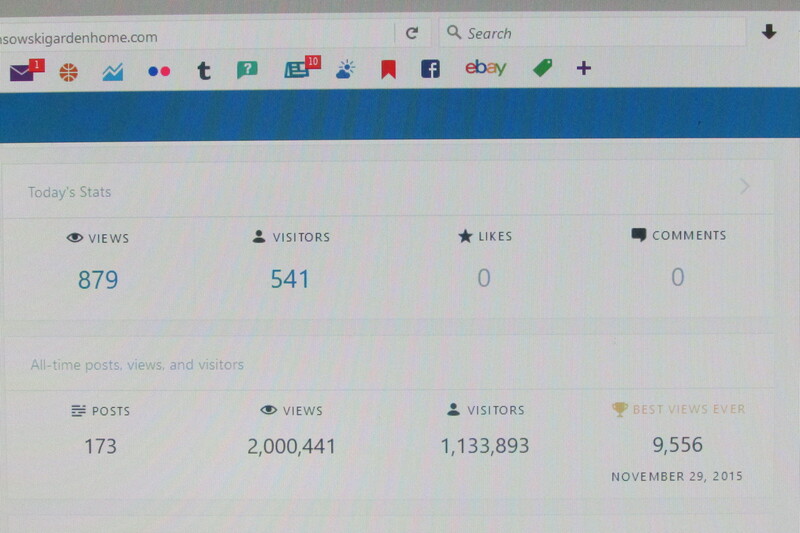 Reaching the 2 million point for articles read was an interesting climb. 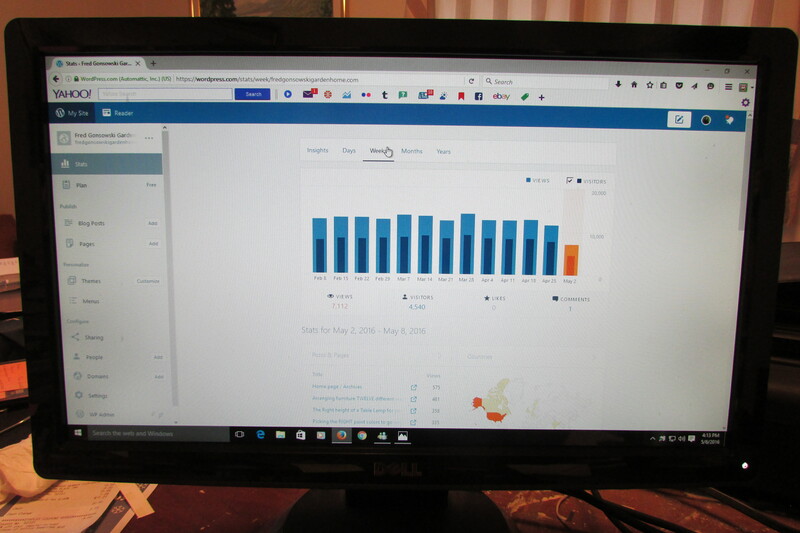 I started the blog on November 1, 2010, and from that day, until December 31 of 2010 I had 299 page views/articles read. 2011 saw an increase with 17,624 views, and in 2012 it jumped to 148,064 views. In 2013 articles read almost doubled to 297,252 page views, the following year, 2014 saw a large increase again to 516,036 articles read. 2015 reached a real high-point with 784,501 page views/articles read, and so far for 2016 236,617 articles have been read, which I hope have been inspiring. 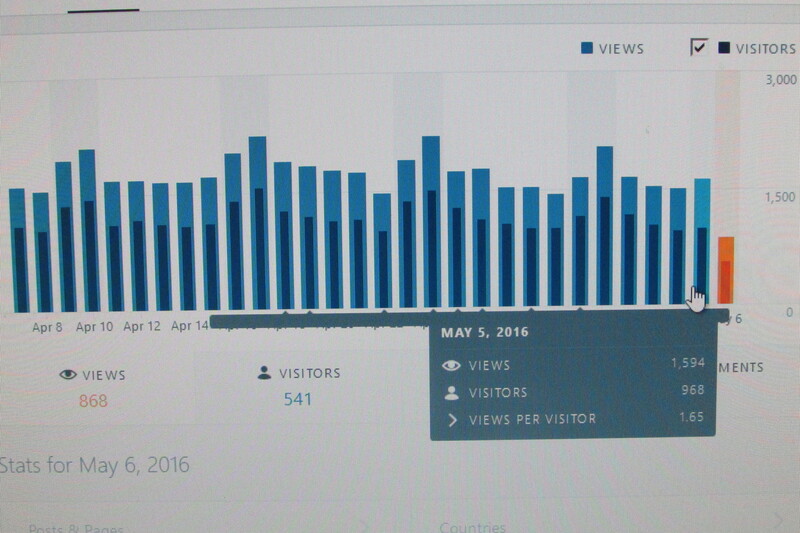 The above photos show the amount of daily visitors that looked at my site from April 8, 2016 through May 6, 2016. 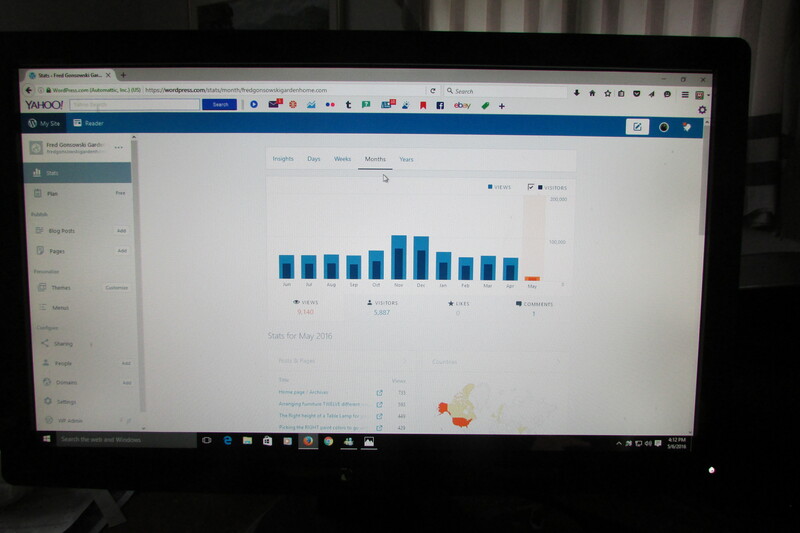 The gray box is opened to May 5, 2016 when 968 visitors looked at 1.65 articles each, which turned into 1594 page views/articles read for that day. 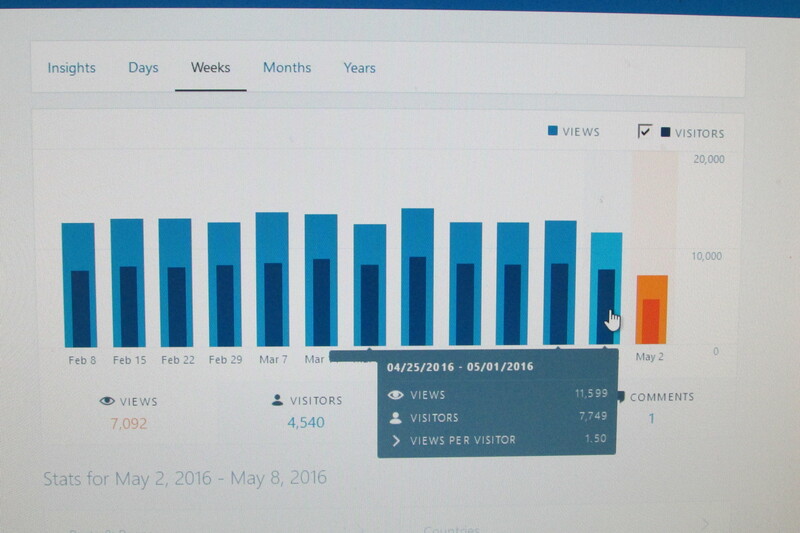 For today, May 6, 2016 as of about 4PM (eastern time) 541 visitors did 868 views. 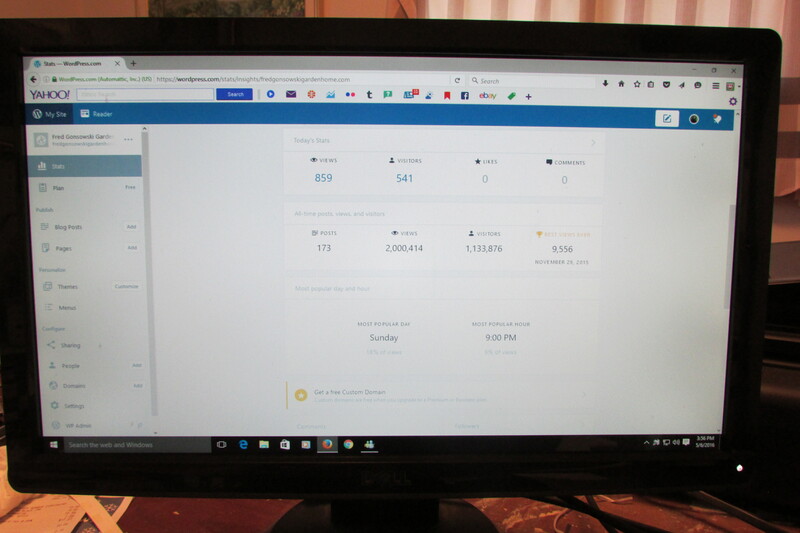 The above photo shows the amount of viewers that came weekly to my site from Feb 8, 2016 through May 2, 2016. The gray box is open to the week from 4-25-2015 through 5-1-2016. 7,749 visitors (the dark blue bar) looked at 1.50 articles each that week, which turned into 11,599 page views (the light blue bar). You can see that, on average, 10,000 or more articles are read per week. 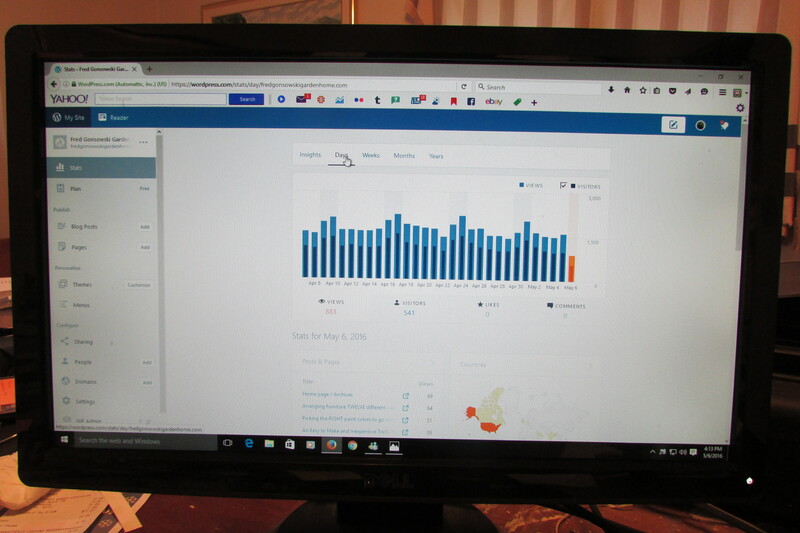 These final two screens show a breakdown of articles read per month from June 2015 through May 2016. 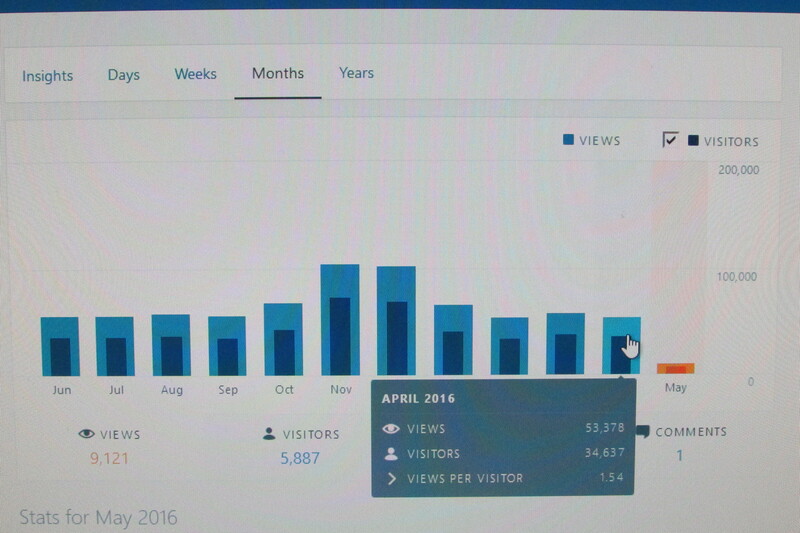 The open gray box shows the month of April 2016 with 34,637 visitors (dark blue bar), reading 1.54 articles, which turned into 53,378 views (light blue bar) for that month. On average 50,000 plus articles are looked at per month, with the exception of November and December, where articles read double with readers’ interest in Christmas themed topics along with the interior decorating and gardening articles. To date my blog has 95 WordPress.com followers and 377 Email followers (combined they make up 472 readers who have joined +Follow). So there you have it, a look at the back side of my website. I want to thank all the Pinterest pinners, Facebook people, eHow, the San Francisco Chronicle and RedBookMag.com for sending tens of thousands (maybe probably hundreds of thousands) of visitors to my site. Without you all, having this many page views/articles read, would have taken a lot longer. WordPress in their 2015 in Review (for this blog) said that people from 199 countries in 2015 looked at this site. If you want to see where they all came from, slowly mover your pointer over the world map, and you will see how many from each country read one of my articles. Congratulations to you Fred! That’s quite an accomplishment! But what I really want to see is how your garden is coming along! I myself, am currently working on a new bed near our gazebo, and I am enjoying the process! Well that sounds exciting! I hope you will show some before and after photos if you can! P.S. The problem in our yards is deer! And, the ocassional bear. But the dear deer do far more harm and really get on my nerves! P.W, all i can say is Deer and Bear, OH MY! The before was started last Fall, and now I have to be careful not to dig things out, thinking they are weeds. Also, last Fall when I did the replanting, I did not have a million daffodils popping up. Now I have then in the way of things emerging. Because the soil was turned over, when replanting, a lot of weeds that I don’t remember having have also sprouted. Many bags of them have been pulled. Also this year, here in the Capital Region of upstate NY, the Winter was terrible. Not much snow, but a lot of things got wind burned and did not get much water. Not one forsythia bush in my area bloomed this year. Also after the only two snow storms, that happened all winter, at the beginning of April, one day apart, there was a real cold snap, which burned the foliage of the daffodils and then the show knocked over the daffodils and snapped off their heads which were about to bloom. The only daffodils that bloomed here were the late blooming variety. Magnolia trees and azaleas had their blooms frozen off, evergreen yews and boxwood bushes were wind burnt, and there is talk of the apple crop being just nothing in some areas. This year I will work on the beds, but until the work is done on the patio area, I’m not in the mood to put out any kinds of pots, that I have to think about workmen ruining in some way. You know a few week project, can turn into a many month event. I’ve started OH TOO MANY seeds, and hope they will make my garden pretty, filling in areas around all of the plants that were divided. When the beds are looking good I will let all of my readers see what the garden looks like this year. I’m at a point where I like the idea of having less, which will be easier for me to maintain. Congratulations! Your posts are always filled with beauty, useful information and inspiration! It’s wonderful that you take the time to share your knowledge. Thank you, Fred! Hi there Mary, I wish I had more time to write things, but I do my best to do what I can. Thanks for your comment! Hats off to you!! I’m not surprised to hear of this good news, your website is wonderful. Congrats! Congratulations Fred! I love your posts and website. I have been inspired many times and learned so much from you! Thanks for all the time you give! Hi there Betty, What a great surprise! I sometimes think about your wonderful mother and father. I hope they are both OK; they called me about two or three years ago and we had a nice conversation. Your father was a major factor in my art selling days. Times changed, people change and things change, so this is my creative process of the moment. If you have a minute read my post “Fred Gonsowski Artwork before the blog. You will see some of the paintings that your father made the frames for. Thank you soo much for commenting, I hope your are doing fine and all is well. Hearing from you was a wonderful way for starting a new day! I just found your website for the first time today and it is an absolute goldmine! Thank you for all your posts and congratulations on your readership milestone! I do have a particular decorating challenge that remains unsolved….and hope that you might have some input. My husband and I recently purchased a civil war era farmhouse on five acres in the Western Finger Lakes. The house has fabulous bones, and we will, over time, be able restore it to its former glory, including the original wavy glass windows that go to the floor. My problem room is in a wing facing north that had to be not-quite-gutted and rebuilt, due to mold from a leaky roof and dry-rotted floor joists. The aforementioned room will be a combined office/sitting room for my husband and me. It is 13’2″ wide by 19″ long. It has an east/west orientation, with two enormous north-facing picture windows to the floor (7′ x 7′), with a five-foot section of wall between them with a wood stove which juts out about three feet. There is a 13′ cathedral ceiling (high point above the woodstove), and there are triangular windows above the picture windows that follow the ceiling line. As you might guess, this addition was put on in the 1970’s on the old foundation and it has a bit of a “70’s ski-lodge” feel. However, we decided to keep the windows, since our view is fabulous, and didn’t want to lose it. We’ve done a lot with moulding and painted V-groove paneling to remove a lot of the 70’s look. My challenge: decorating around the jutting wood stove, which was a concession to the sometimes vicious winters in these parts. I want to be able to use wool rugs, which are important in keeping the floor warm, but I am not sure how a patchwork of rugs would look in that room given that it’s chopped up by the stove. Similarly, I would think a large area rug with a cutout for the wood stove would look really odd. I think I have a reasonably decent floor plan for two desks, a small sofa, additional lounge chair, and some cabinetry for storage. But I am totally stumped about what to put on the floor! I should say that the room is tiled with a wood-look tile (not my first choice) to obviate an risk of water damage or mold growth. Hence the need for wool carpet as an insulator. The other odd thing that struck me is that typically the fireplace or woodstove becomes the focal point in the room; however, in this one, the windows on either side of it completely dominate – in a good way. Any thoughts you can give me would be greatly appreciated, but I totally understand if this is more than you’d care to comment on. Best of luck to you in this wonderful pursuit. Hi there Dale, sorry to have taken so long to respond. For your room, not really seeing your space, I would suggest the two area rugs. I’m thinking you have two possibilities options for what you purchase. (1) you could buy two matched rugs, that way you would have continuity of pattern and design in the space. (2) you could buy two different rugs, but one of them should be bolder in pattern than the other, and the bolder one would be used as the “focal point” in the space, and the other one as a subordinate patterned rug. When picking two different patterned rugs, they should share a commonality of colors so they look good together. If you went the two different rug way, take samples of all the fabrics that you have for drapes and furniture for you room, and bring them to the rug store. Go through the rugs and place your fabrics up against things that interest you. When you find the first rug, then have the rug dealer put other similar colored rugs next to the first one, and your fabrics to see if it all looks good together. I want you to read some of my posts on fabrics and patterns….They might help you understand the topic a bit more. Good luck with your project. Pick (Use) four colors when Decorating a Room 3-7-2011. Where have you been my whole life, Fred?! (FYI I found your blog via a google search for “foundation plant* yew”). You’re a friendly and knowledgeable resource on two of my favorite loves: gardening and interiors. Thank you, thank you for so lovingly curating such a helpful blog.